I know it sounds like crazy talk. I’m sure once upon a time I’d have rolled my eyes at anyone telling me that lasagna noodle sheets could be replaced by sliced sweet potato strips and still be just as good. And listen – I’m not going to sit here and try to tell anyone that using random veggies in place of our favourite carb filled foods is exactly the same because it’s absolutely not. But honestly, when done right the main flavours are all there and it can be just as delicious. Especially when the food in question is topped with a with guacamole. Anything topped with guacamole has to be good, yeah? 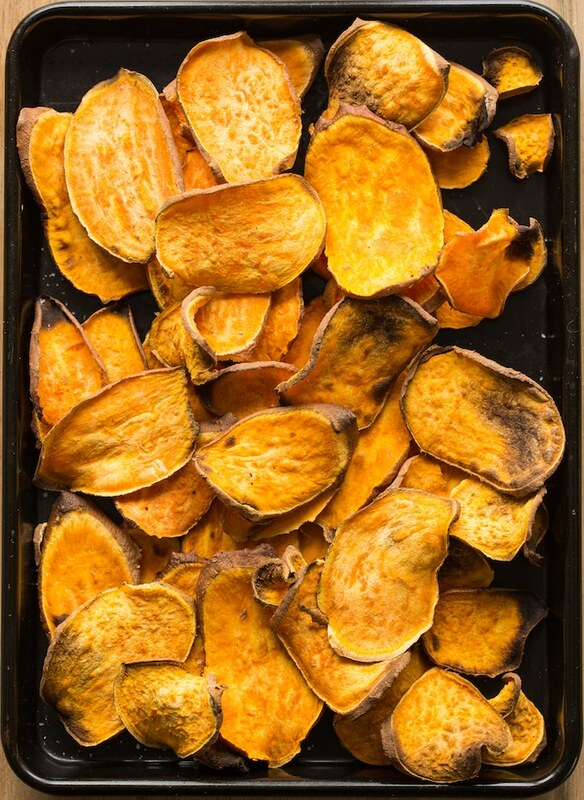 The sweet potato chips are pretty easy to make – made even easier if you own a mandoline slicer (<–affiliate link) for fast and even sweet potato slices. 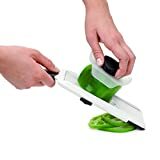 If you don’t own a mandoline – no worries! A little patience and a good knife will do the trick. When it comes to making nachos I prefer to sliced the sweet potato into 1/4 inch slices. A little extra thickness makes them crispy on the outsides, a little softer in the middle but sturdy enough to hold all kinds of toppings (guacamole, carnitas etc). That being said feel free to slice these up however you want to your own liking. Just Keep in mind that the thinner you slice the quicker they’ll cook so you’ll need to check on them a few minutes sooner than you might otherwise need. 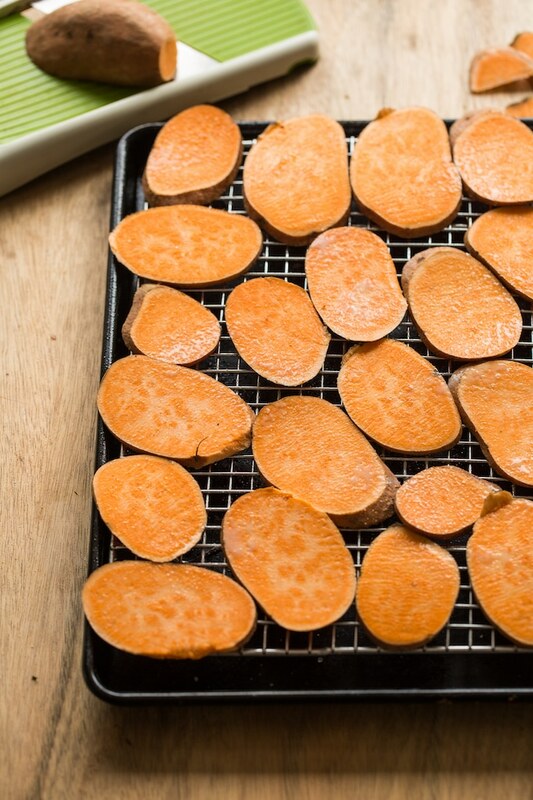 Once your sweet potato is sliced and ready to go begin to arrange them on a baking sheet fitted with an oven safe wire rack. Lay them out in a flat even layer making sure not to overlap and slices. Baking them over a wire rack allows hot air all around the potatoes making for a more even cook. Sprinkle with a little salt and then place in the oven to bake. They’ll need about 15 minutes to bake before you need to pull them out to flip everything over – then go back in for another 10 or so minutes. When you’re all set it’s just a matter of piling everything on and then enjoying! You can get more creative here with toppings based on what you like or what you have. Here, I’ve just gone with some homemade guacamole and leftover instant pot chicken carnitas. 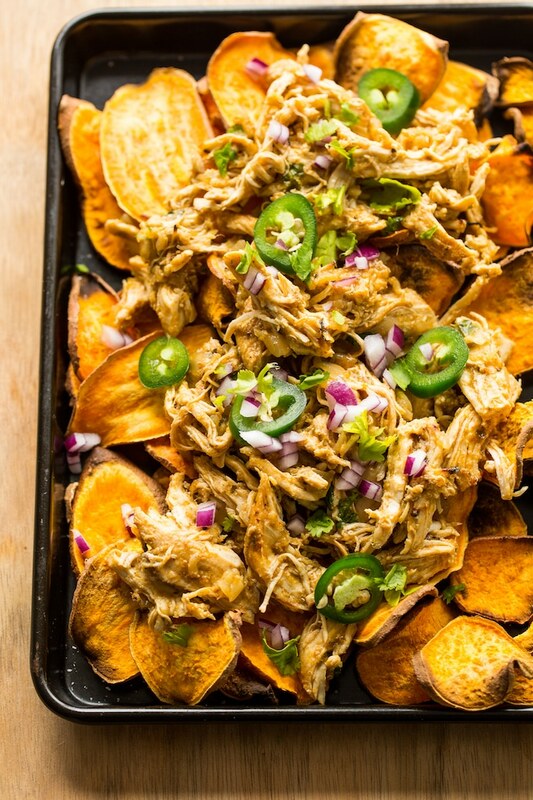 And after all this you’re still not convinced that’s totally fine – more sweet potato nachos for me! 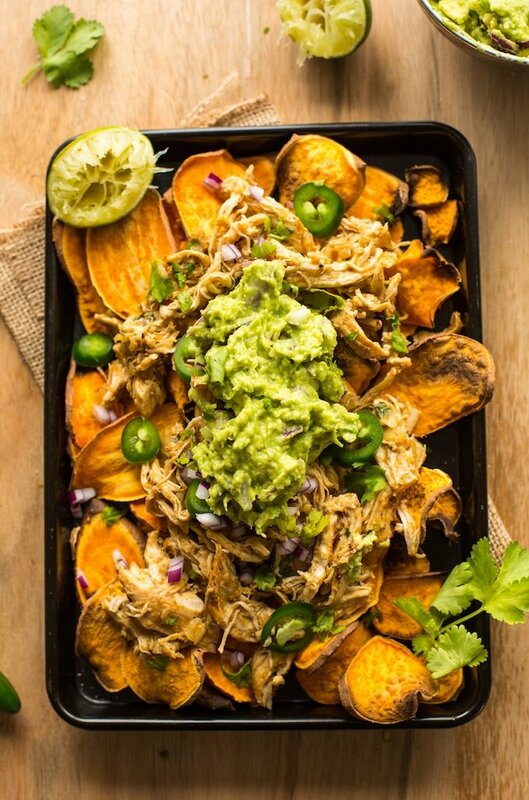 Don’t forget to #asaucykitchen on instagram if you try these Sweet Potato Nachos with Chicken Carnitas. I love seeing what you make! You can also post your pictures to my facebook page! Preheat oven to 400°F/205°C. 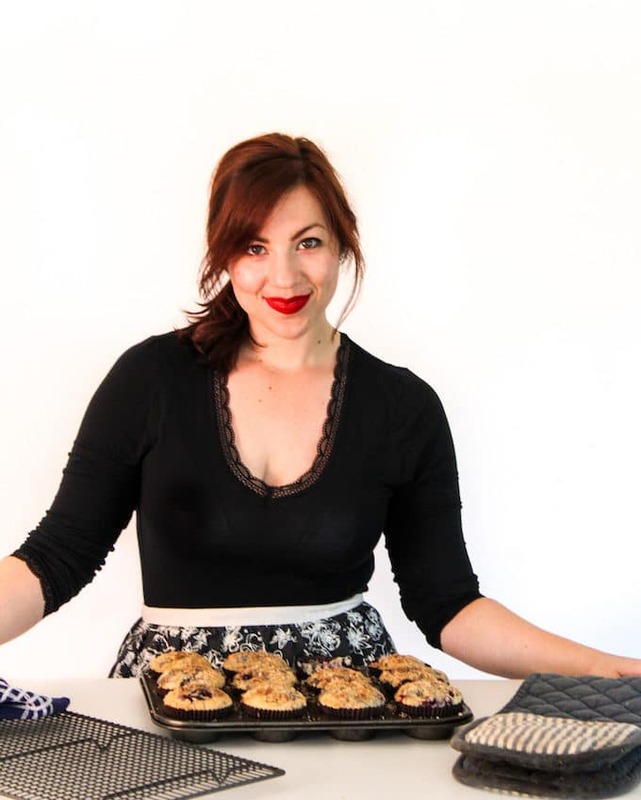 Place a large, oven safe cooling rack over the top of a large baking sheet. Lay the sweet potato slices across the top of the wire rack. You may need to use an additional baking sheet if there are too many slices. Make sure that the slices are not overlapping. Baking on a wire rack allows for air flow/heat to get under the sweet potatoes making for ultimately, more evenly cooked/crispy 'nachos'. Sprinkle with salt. Place in the oven and bake for 15 minutes. Take the sweet potatoes out, flip them all over and then return to the oven and bake another 10 minutes. The edges will start to pull up and crisp slightly. Remove the wire rack from the sheet. Move the sweet potatoes to a large serving platter or use the baking sheet to serve. Pile the chicken carnitas on to the top of the sweet potatoes. Scatter the onion, jalapeno and cilantro over the top followed by the guacamole.